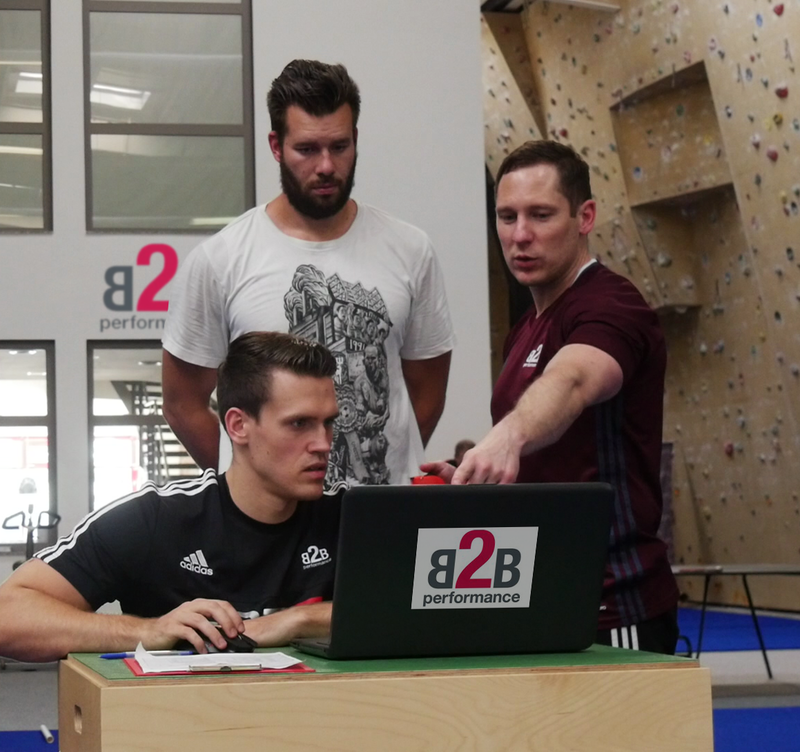 We spoke to Björn Wienhold (owner, right) and athletic trainer Oliver Isdepski (left) from B2B Performance in Dortmund, Germany about their training philosophy and how they integrate Omegawave in their day-to-day work with the athletes training at their high performance gym. (Seen in the photo with German discus thrower Martin Wierig, PB 68,33m). Omegawave: How important is the training and recovery management process at B2B Performance? Björn Wienhold: Training and recovery management play an integral role at B2B Performance, especially while working with athletes during their season. Both supporting and extra imposed training and recovery interventions are meant to be part of a collaborative effort with the team, but ultimately are sought to benefit the athlete. In this regard, Omegawave helps us to objectively assess the athlete’s readiness, as it is our goal to get our athletes in the best possible physical condition when they take the field. OW: What type of data do you collect? Oliver Isdepski: Besides the Omegawave data, we collect several other parameters. For example, for us it is also important how the player subjectively feels and perceives stress. That’s why we ask our athletes to provide us with information regarding their sleep length and quality, muscle tonus and motivation. On top of that, all athletes perform jump tests and step on a scale before the upcoming training sessions. OW: How do you individualize the training for the athletes you work with based on the data you collect? How do you put the data into practice? Björn Wienhold: During the competitive season and while the athletes are still training with their teams, we place our emphasis mostly on injury prevention. Although sometimes readiness parameters and perceived freshness are good, we are still careful with applying high loads because we never know what the team coaches might do with the athletes in the training session on the following day. Without knowing the training plans of the athletes’ coaches, it is simply not advisable to create a training routine that aims at performance enhancement. Therefore, utilizing the data for preventive purposes is more effective in our work with the athlete while the season is still ongoing. Oliver Isdepski: During the off-season and when the athletes are for the most part training exclusively with us, we use the data for targeted training interventions. To achieve maximum performance, however, we still try to keep a balanced ratio between training load and recovery for the athlete. Specifically, here we use the player’s readiness data to determine when to apply appropriate training stimuli or when to focus on recovery interventions instead. In our experience, 4 days of optimized training—while keeping 3 rest days—are sufficient to achieve performance enhancements while at the same time not burning the athlete out for no reason. OW: How do you monitor athletes that cannot train with you all the time, yet who ask for your expertise? Oliver Isdepski: To consult athletes remotely, we use Omegawave. Via our Omegawave Coach system, we can access the athletes’ data at any time and place, which allows us to provide support regarding their daily training routines. In regularly scheduled phone calls, we then discuss with the athletes ways that could potentially help them to either maintain or even increase their level of performance. OW: What data surprised you and how did you deal with it? Björn Wienhold: While we were working with a soccer player during his season, we recognized a trend of increasing sympathetic drive. Even two days of active rest wouldn’t show a change in his data. However, therapeutic interventions allowed us to decrease his sympathetic tone within just one hour of treatment. After that, we assessed him again and could observe a much more balanced ratio between parasympathetic and sympathetic activity. The intervention included trigger point therapy, loosening the diaphragm and breathing exercises to enhance relaxation. The athlete not only felt better subjectively, but also had a much lower resting heart rate after re-assessing him. OW: What potential do you see in the future to further optimize the personal training for elite level athletes? Björn Wienhold: An individualized approach to training is crucial as every athlete responds differently to stress. Athletic training should consider these individual differences. However, collecting only subjective feedback may be not enough to fully assess an athlete’s overall readiness. A potential defeat on the previous weekend might distort the perceived feeling of stress. Consequently, additionally collected objective data can help to truly assess the current functional state of an athlete. This approach should be the benchmark for any athletic coach. Oliver Isdepski: It is important to get away from the philosophy of just thinking from one match to the next. If we truly want to improve the performance of the athletes we work with, we must recognize signs of fatigue, which naturally occur in daily training routines. This in turn helps us to make the right decisions to keep our athletes as fresh as possible through-out the season. This is where Omegawave is helping us the most.